1. SOUP is a liquid food that is prepared by boiling meat or vegetables, or both, in water and then seasoning and sometimes thickening the liquid that is produced. It is usually served as the first course of a dinner, but it is often included in a light meal, such as luncheon. While some persons regard the making of soup as difficult, nothing is easier when one knows just what is required and how to proceed. The purpose of this Section, therefore, is to acquaint the housewife with the details of soup making, so that she may provide her family with appetizing and nutritious soups that make for both economy and healthfulness. 2. It is interesting to note the advancement that has been made with this food. The origin of soup, like that of many foods, dates back to practically the beginning of history. However, the first soup known was probably not made with meat. For instance, the mess of pottage for which Esau sold his birthright was soup made of red lentils. 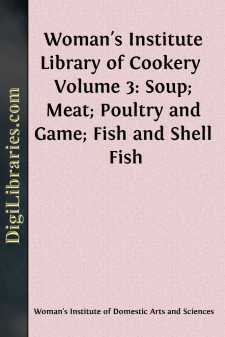 Later on meat came to be used as the basis for soup because of the agreeable and appetizing flavor it provides. Then, at one time in France a scarcity of butter and other fats that had been used to produce moistness and richness in foods, brought about such clear soups as bouillon and consommé. These, as well as other liquid foods, found much favor, for about the time they were devised it came to be considered vulgar to chew food. Thus, at various periods, and because of different emergencies, particular kinds of soup have been introduced, until now there are many kinds from which the housewife may choose when she desires a dish that will start a meal in the right way and at the same time appeal to the appetite. 3. VALUE OF SOUP IN THE MEAL.--Not all persons have the same idea regarding the value of soup as a part of a meal. Some consider it to be of no more value than so much water, claiming that it should be fed to none but children or sick persons who are unable to take solid food. On the other hand, many persons believe that soup contains the very essence of all that is nourishing and sustaining in the foods of which it is made. This difference of opinion is well demonstrated by the ideas that have been advanced concerning this food. Some one has said that soup is to a meal what a portico is to a palace or an overture to an opera, while another person, who evidently does not appreciate this food, has said that soup is the preface to a dinner and that any work really worth while is sufficient in itself and needs no preface. Such opinions, however, must be reconciled if the true value of this food is to be appreciated.